Muscle cramps can be a painful experience, and many of us have woken up with that excruciating feeling in a major muscle, perhaps you’ve experienced one in your calf? Spasms are involuntarily contracted muscles that do not relax. If this spasm is sustained, it becomes a muscle cramp. Some muscle cramps are visible, and you can see the muscle twitching or contracting on its own. Many cramps only last a few seconds, but if more severe it may last for up to 15 minutes and may reoccur throughout the day until resolved. Muscle cramps are most common in adults and tend to increase in frequency and intensity with aging. They may involve the whole muscle, part of a muscle, or multiple muscles that tend to work together like those in your fingers. 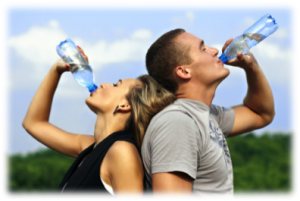 One of the most common causes of muscle cramps is dehydration. As you know, when you participate in sports or workout, you sweat. This increased perspiration, especially in warm weather, can lead to dehydration and may induce a cramp. Keeping hydrated is a simple and effective technique to lowering predisposition to cramp, especially in older adults. Sodium loss through sweating can also lead to cramps caused by dehydration. Having a healthy amount of electrolytes and of course water, in your diet will help to avoid true cramps. Low levels of calcium or magnesium in the blood lead to an increase in the excitability of nerves and the muscles they stimulate usually causes the spontaneity of cramps. If you are taking diuretics or have a vitamin D deficiency, it can have a negative effect on the body’s ability to absorb calcium and magnesium. Yes, it’s true – there are different types of muscle cramps. The most common type is true cramps, which involve whole muscles or a group of muscles. True cramps are often caused by hyper-excitability of the nerves that stimulate the muscles, and may occur as a protective mechanism following an injury, like a broken bone. Post-vigorous activity, when muscles may be fatigued, may also induce true cramps. Similarly, being sedentary for a long period of time, or staying in an awkward position can cause cramps. True cramps at night are called rest cramps. Rest cramps can be disturbing to your sleep, especially because they tend to be repetitive, whether that be many times a night or spread throughout a week. Tetany occurs when the nerves in the body are triggered, which then stimulate the muscles. Low calcium and magnesium, as discussed above, are the main cause of these cramps, as they most affect nerve action. Often tetany cramps are felt in more than one place in the body at once, and also may be paired with a tingling feeling. Tetany cramps may get disguised as true cramps, but often the triggers are similar, it pays to keep your calcium and magnesium levels at normal levels. Dystonic cramps occur when muscles not required for a specific movement are contracted. Muscles that undergo dystonic cramps are usually the muscles involved in the opposing movement, or muscles used for movement exaggeration. For example, when extending your arms and using your triceps, your biceps (not being used) may get a dystonic cramp. Eyelids, neck, jaw, and other smaller muscles may also experience muscle cramps, as well as hands and wrists after repetitive movements like writing or typing. Dystonic cramps are the least common, and when they do occur may lead to a true cramp. If you have not experienced a cramp before, there are a few symptoms to be aware of. When a cramp occurs, the tensed muscle will feel firm, will bulge out a bit, and may feel tender. Cramps tend to be painful, and usually will call for your immediate attention (in other words, they’re very hard to ignore!). There are a few things you can do to help muscle cramps when they do occur. Stretch it: Holding the effected muscle in a stretch for 15-20 seconds can help relieve a cramp, or if the cramp is in your lower body, a quick walk around may be beneficial. Massage and heat: You can use the palm of your hand for self massage (or grab a friend) to help relax a tensed muscle. If you have access to heat quickly, this can help too. Hydrate: If you are aware that your muscle cramp is due to dehydration, make sure to hydrate as soon as possible and perhaps include an electrolyte to assist with salt and potassium balance. Medication is normally not needed as treatment as cramps are usually resolved before the medicine would have effect. If cramps unbearable and frequent, contact your doctor to discover if the cramps are a symptom of another issue that needs attention. Measures used to treat muscle cramps can also be used as prevention. Stretching before and after exercise, having an effective warm-up and cool down, and staying hydrated throughout the day are all prime actions that can be taken to avoid a cramp. Other daily habits may also help in prevention, like keeping a good posture, taking activity breaks, and using proper form during a workout. Stretching before sleep, and taking an extra dose of calcium will also help with rest cramps and will give you a more restful night!